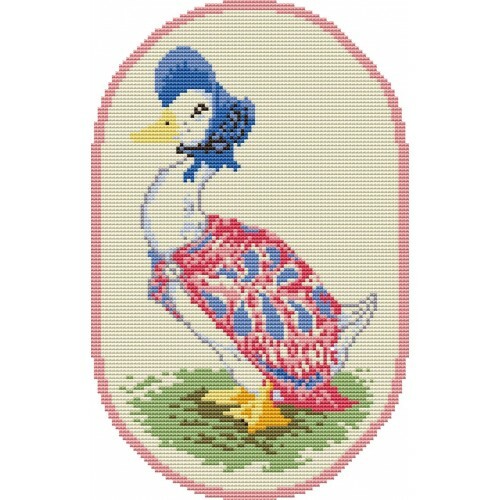 Jemima Puddleduck latch hook rug kit with stencilled canvas in Romney rug wool. Size 68cm x 97cm (27in x 38in). Kit includes hand stencilled canvas, cut packs of Romney pure wool, latch hook tool, binding kit with needles and instructions. This is an original Anchor / Readicut rug kit. 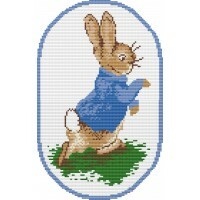 Beatrix Potter © Frederick Warne & Co Ltd. The picture shows a graphic illustration of what the completed rug looks like.